From the Capitol Beltway (495) - Take Route 66 West to Route 123 and head south into the City of Fairfax. Pass Main Street (Pre-Civil War Courthouse with cannon on the right, Mobil Gas Station on the left) and continue to Armstrong Street, second left after Main Street. Pretzelman Printing Group is located on the left/north side of Armstrong Street opposite Fairfax City Hall. Parking is available on the street or in the Inns of Court gated parking lot. Alternate from Capitol Beltway (495) ­ Take Braddock Road West approximately 5.5 miles to route 123 north. Make right onto Armstrong Street. Pretzelman Printing Group is located on the left/north side of Armstrong Street opposite Fairfax City Hall. 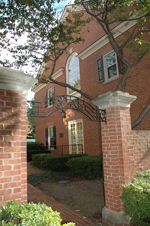 Parking is available on the street or in the Inns of Court gated parking lot.